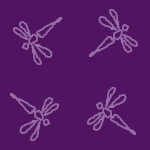 Purple Dragons Fly- when dreams cause those who dream the most to unite. Personality: You would never see her as a seventeen year old woman. She has the air of frailty that makes one think of someone of a younger age, perhaps even eleven. It is perhaps this air that causes even the most rowdy guests at Dragons Fly to calm at her words, for there is something so childlike about her that one cannot help but feel... wary. A shy, bookish woman who found work at Dragons Fly, her almost obssessive worship of Kista is almost amusing at times, until you look into her heart wrenching eyes- then it's impossible to laugh at her. A very peaceful young woman who is very submissive, she has caught the heart of many and her terrified behavior when ever it comes to causing anyone any kind of pain is almost heart wrenchingly sweet.